Hammer’s The Phantom of the Opera is one of the most revered of all the Hammer horror films. Eerie? Check. Atmosphere? Right on. Over-rated? Absolutely. While The Phantom of the Opera is a welcome addition to the shelf of horror classics, when I hear Hammer experts talk about this film as director Terence Fisher’s “best” or Hammer’s “best”, I have to wonder what the hell they are talking about. There’s no use adding a summary, as Hammer didn’t deviate much from the traditional Phantom plot that we’ve all come to know and love. This isn’t to say that this version is simply a rehash of what came before. The origin of the Phantom is brand new. Revealing the origin would ruin the mystery for most people, so I will just say that Hammer moves away from the “deformed freak full of rage” as seen in most versions of the Phantom, and instead gives him an intrinsically human quality. This made it easier to sympathize with him (for almost any classic horror monster to work, there has to be some level of sympathy), and it worked very well in the film. Also, the origin actually gives a discernible reason for the Phantom to be haunting the Opera in the first place instead of the “oh, him? He’s always been there.” tactic that most versions have used. That just made you more emotionally invested in both him and the story, which makes it one of the better versions of the tale ever told. But as far as it being the “best” Hammer film or even the “best” Terence Fisher film? It is not. I’m going to talk about the negative points first, because that’s the type of girl I am. Let me just go on record by saying that these points are only meant to dispute the rampant overrating of this film. And the reason I do this is to prevent a backlash. When people go into a film that has been rated obscenely high, they will probably be disappointed if it was just merely good. And this is bound to be what happens with The Phantom of the Opera. It really is a good film for reasons I’ll mention later. I’d even go so as far as to label it as required Hammer viewing. The problem is that it’s being labeled “infallible”, and it isn’t. So, with that being said, on with the pessimism! I’ll first dispute the “best Terence Fisher film” assessment. It’s certainly his biggest production by sheer volume of actors and the set design. But bigger does not always mean better. Fisher is well known for his signature eerie lingering shots. In this film, only one scene jumps to mind as being really exceptional -- a lingering upward shot when the Phantom is at the top of the stairs. It gives the Phantom a larger-than-life feel (much like the camera tactics used to play off on Christopher Lee’s height when he plays Dracula). But other than that, it's simply standard Hammer horror tactics. This is not a bad thing, as the film overall works. 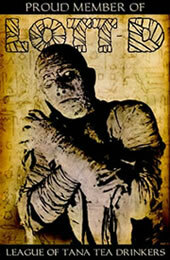 But to compare typical horror fare to Fisher’s ground-breaking Curse of Frankenstein? That’s just crazy talk. Not to mention, there seems to be a lot of Crap No One Cares About. The love story between Christine and the manager of the opera is emphasized far too much (and the carriage scene really should have been deleted entirely). It doesn't deter your interest at all, but it doesn't contribute to the film’s ending, as the only thing that really matters is the Phantom’s relationship to Christine. I daresay the romance angle is completely unwarranted in this version, and the film could definitely have benefited from deleting those scenes in lieu of spending more time developing the relationship between Christine and the Phantom. Also, the Igor character seems somewhat lost in the story. And when the script actually takes time to describe Igor’s origin, we get, “oh him? He’s always been there.” I guess that rule must be incorporated in every version of Phantom somewhere, but it comes off as weak. And see, I just disputed the “this is the best Hammer film” argument. Aren’t I efficient? All right, the icky stuff is done now. See, that wasn’t that painful. So why is it worth seeing? A couple of reasons. The main reason is that the Phantom’s backstory is written so divinely that it obscures all other missteps the movie makes. As mentioned previously, you know that this isn’t “just another Phantom.” This is a Phantom with a purpose, and his history is revealed in such a manner that you have to keep your eyes to the screen. It reminds me of watching a standard modern day “twisty” suspense tale. You know upfront who the bad guys and good guys are, but how they GOT there is the whole ride. And in this vein, Phantom doesn’t disappoint. Being intentionally ambiguous as not to ruin the surprise for future viewers, his backstory is one of the most interesting and well thought out of all the Hammer characters, ever. And that’s a tall order to fill, folks. The main reason the Phantom’s backstory works so well is due to Terence Fisher. He drops subtle clues early on indicating that the Phantom holds a deeper secret than what is being revealed. As the movie progresses, more and more clues are revealed, but he leaves the “big bang” for the climax. This formula never seems to fail when Fisher is behind the wheel. A good comparison would be to Hammer’s Captain Clegg, in which the audience know there is something more to the story than what is occurring, and it is this suspicion that keeps the audience’s attention. I dare say Phantom does it better, because the secret is more subtle. Whereas Captain Clegg is just a series of random scenes that you have to “wait and see how they connect,” Phantom leaves you with the feeling that there COULD be a deeper secret, but it is entirely possible that there isn’t. This subtlety is not often seen in Hammer, but when it’s done, it’s often done to perfection. Also, even though the film does not star anyone particularly famous, the actors are quite good. This is mostly because all the characters are one-dimensional, except of course for the Phantom (which, given the emphasis on the Phantom, is how it should be). Michael Gough, who is the Lenny Briscoe of English cinema, gives a great look to the evil Lord Ambrose D’Arcy. But the true star of the tale is Herbert Lom as The Phantom. He has the perfect blend of vulnerability, ambition, and sheer rage for the role. I’m actually surprised he didn't have more of a presence in Hammer films, given the sheer depth he displays here. He does a simply amazing job. The Phantom of the Opera is a Hammer classic that will be enjoyed by all those who love Hammer or classic horror monsters. But like most enjoyable Hammer films, it has flaws that can hardly be ignored, which makes it undeserving of the pedestal it is given. Go in with high expectations, as it will surely meet them. Just don’t go in thinking this is the quintessential Hammer experience, as you’ll be setting yourself up to be disappointed. Submitted by Vin Smith (not verified) on Sat, 2010-02-06 02:36. This is my favorite Phantom film. I think for three reasons. First, Michael Gough is a delicious villain. Second, Herbert Lom paints his acting pallette with just the right mix; you fear him, you loathe him, you grow to love him, in a way that surprises. And finally, Heather Sears was one of the most charming--if somewhat obscure--leading ladies of her day. You just want to wrap your arms around her in a protective embrace. Submitted by Gwen (not verified) on Sun, 2010-09-26 05:46. Submitted by Wayne (not verified) on Tue, 2010-11-30 14:00. Boring, stupid and an insult to the original "Phantom". It's not remotely scary and does anyone notice how Michael Gough (after a big buildup as the villain) disappears almost completely! Herbert Lom is a good actor--but not here. He's not as menacing or as scary as the Phantom should be. And when HE TORE OFF HIS OWN MASK at the end I just fely like throwing something at the TV! Not only was the makeup pathetic but there was NO reason for him to do it. No chandelier falling on the audience either. A horrendous film--one of Hammer's worst. Skip it. Submitted by Anonymous (not verified) on Sun, 2010-12-19 17:32. Oh! I loved this film! Why do you hate it so?! There are plenty of phantom films that are bad (like the animated version) but are still pleasant to watch. This film was adorable! Submitted by Anonymous (not verified) on Sun, 2010-12-19 17:36. It is NOT an insult! It's one of the best, if you have the mind for it! Every Phantom is different, and this one is much more pleasant and nicer than any of the others. Herbert Lom does an excellent job here, not perfect, of course, but who can be perfect? Noone. He tore off his mask to add dramatic affect and so noone would have to take it off for him when he was dead (he has privacy issues). Michael Gough disappeared because the storyline didn't need him at that point.This is an EXCELLENT film and I recommend it to any Phantom fan who has the guts to watch it. Submitted by Wayne (not verified) on Mon, 2010-12-20 05:47. You're sort of missing the point. Have u ever read the original novel? The Phantom is NOT supposed to be a nice guy--he's an evil psychotic maniac! His obsessive (it totally understandable) love for Christine Daae has him committing murders and not letting anything stand in his way. In the Hammer film version he's little more than a stern guy totally destroying any menace he might have had. Herbert Lom IS an excellent actor but the poor guy has nothing to work with here! And his tearing off his own mask was just stupid! Submitted by Anonymous (not verified) on Mon, 2010-12-20 17:41. YES, I have read the novel several times! But this version makes him nicer, which is a nice change of pace. Submitted by Wayne (not verified) on Tue, 2010-12-21 05:40. Making him nicer is a nice change of pace???? This is supposed to be a HORROR movie not a stupid drama about a disfigured man who is SO nice that he hides in the basement, kills people AND teaches a woman how to sing! Submitted by Anonymous (not verified) on Wed, 2010-12-22 21:20. Ah, you forget. His friend kills, not him. How is teaching a woman how to sing a bad thing? Sympathy isn't always a bad thing, either. Submitted by Wayne (not verified) on Thu, 2010-12-23 07:12. Teaching Christine to sing is not a bad thing---but WHY? There's no reason. He's certainly not in love with her like he was in the other versions. Submitted by Anonymous (not verified) on Thu, 2010-12-23 09:41. So jumping down to save her from the chandelier isn't love? Besides, he felt that she was the only one good enough to perform his music the way he wanted it to be performed. Submitted by Wayne (not verified) on Fri, 2010-12-24 09:00. I wouldn't call it love. He LIKED her but that's as far as it went. Point out just ONCE where he said he loved her! He loved her voice NOT her. Submitted by iheartslashers on Mon, 2010-12-27 10:02. Hmm. You've got a point when he said he liked her voice. But if I, or anyone else for that matter, merely liked someone, I wouldn't put my life on the line for them. Now, say if I, or anyone else, loved someone, then I'd put my life on the line for them. She loved me for the dangers I had pass'd, and I loved her that she did pity them. Submitted by Anonymous (not verified) on Fri, 2011-01-07 00:53. This version is very atmospheric and chilling in parts. At the very least, it is a great drama (not a chiller, mind you) and Herbert Lom, the excellent actor he is, does a wonderful turn as the Phantom. One of my favorite Hammer horrors of the time. Cushing or Lee would not have been able to bring the pathetic yet threatening demeanor that Herbert Lom did to this character. Two Thumbs Up from Arizona! Submitted by iheartslashers on Tue, 2011-01-11 14:54. I don't find it chilling at all. But I do agree with you wholeheartedly when you said that Lom made the character sympathetic. That's why this version is my favorite. Submitted by Mr. Y (not verified) on Sat, 2011-04-23 10:14. I just want to say, The Phantom's makeup is really creepy, and realistic. I mean, It may look mild compared to other Phantoms' makeup, but if you saw him walking down the street, you would either run the other way, call the police, or get sick. It's really good. Submitted by An Elf (not verified) on Thu, 2013-03-14 03:51. Submitted by Doctor Mabuse (not verified) on Sun, 2013-07-07 01:59. I must stand up for this film, which I certainly find to be one of the best of Hammer and director Terence Fisher. I must acknowledge that of the first three classic film versions of The Phantom of the Opera, this one is my personal favorite which simply gives me the most pleasure. With all due respect to the original Lon Chaney masterpiece (1925/29), this version works best for me as a mystery-thriller in the fashion of the pulp "yellow press" novels of Gaston Leroux and others. The film lacks the epic grandeur of its two more famous progenitors yet benefits enormously from well-developed characters, strong acting and appealing performers. In place of the fantastical European setting is a fairly realistic depiction of Victorian London with evokes the flavor of Leroux's English counterpart, mystery novelist Edgar Wallace. 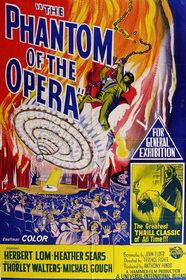 The screenplay by John Elder (pseudonym for Hammer producer Anthony Hinds) emphasizes drama rather than the high melodrama of the film's epic predecessors. It must be made clear that this is not a direct adaptation Leroux's novel but a careful reworking of the highly original scenario of the (vastly underappreciated) Technicolor Musical version (1943) starring Claude Raines. That retelling of Leroux's story was primarily concerned with establishing a tragic origin for the disfigured and masked "Opera Ghost" as a sympathetic victim of injustice. Elder faithfully adapts the 1943 script while restoring the original's sense of mystery and Gothic horror. This approach is perfectly in line with the underlying humanism that is the hallmark of the best films of Terence Fisher (HORROR OF DRACULA, BRIDES OF DRACULA, REVENGE OF FRANKENSTEIN, FRANKENSTEIN MUST BE DESTROYED, THE DEVIL RIDES OUT, etc.). Terence Fisher himself is the key to the film's excellence. Unlike the directors of the Lon Chaney and Claude Raines versions (Rupert Julian and Arthur Lubin, respectively), Fisher was a genuine artist of long standing as well as a master of the Gothic cinema. I have no question that his PHANTOM is one of Fisher's (and Hammer's) finest works. The film is hardly "overrated". At the time of release it was a critical and commercial failure and bore the stigma of that rejection for many years. Hammer blamed Terence Fisher who temporarily left the company yet came back in a big way. Decades passed before critical reassessment found this to be Hammer's (and especially Fisher's) most maligned films. I have read of a college course which taught Terence Fisher with a screening of a dozen of his Hammer films. It was reported that when polled the students in the class almost universally chose THE PHANTOM OF THE OPERA as their favorite, citing the emotional power of the drama as the basis of their preference. Hammer's THE PHANTOM OF THE OPERA (1962) is not a perfect or unflawed film but then neither are the 1925/29 and 1943 versions -- nor, for that matter, Gaston Leroux's pulp novel itself. To my mind, however, it stands firmly on a par as one of the three most memorable versions of the story prior to the 2004 filming of Andrew Lloyd Webber's operetta. Submitted by Matt (not verified) on Thu, 2015-04-02 14:18. I coincidentally discovered that significant chunks of Jenn Dlugos' article above were used in an uncredited review appearing in JamesDunn81's "Murder Legendre" site, which I found to be troubling. (https://murderlegendre.wordpress.com/2009/12/14/phantom-of-the-opera-1962/) I have left a note there, now awaiting moderation, and I hope the site owner will rectify the situation.